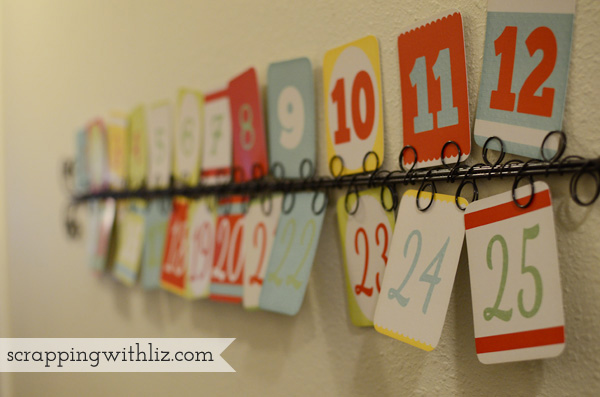 This post is kind of a collection of some of the other (non-digi) crafty things I've done this month. I always have grand plans of doing different posts for each project....but well, it never happens. There are just not enough hours in the day. The photos always just sit in their folder waiting to be blogged about. So today I'm going to share a few photos of some of the projects I've done around the house this month....before I forget about them! First is my chalkboard. Remember my Christmas chalkboard from last year? Well, it was time to make a new one. 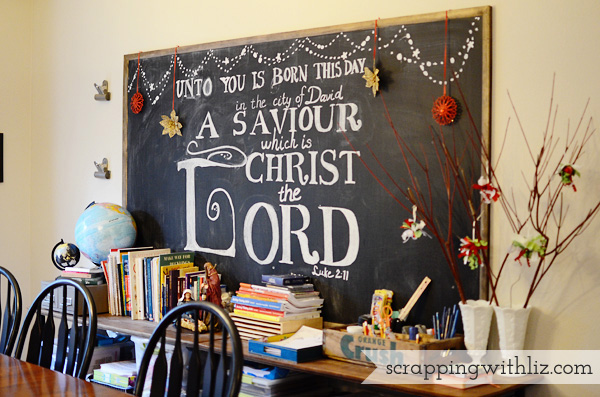 I searched different Christmas chalkboard art on Pinterest and mixed and matched a few that I like, and I ended up with this. I decided that this Christmas season we were going to start a new tradition. All the kids are going to make a Christmas ornament each year. 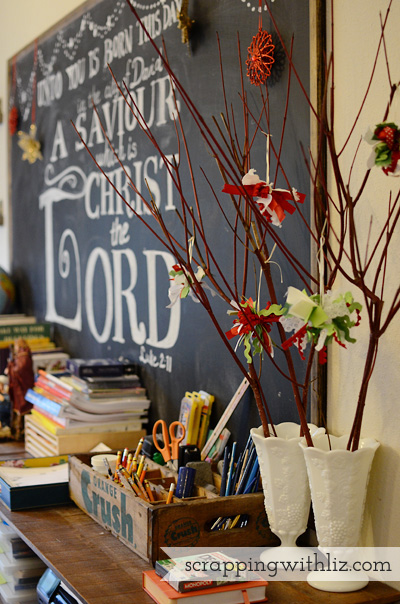 When they are grown and have their own tree they'll get to keep all the ornaments they've made through the years. 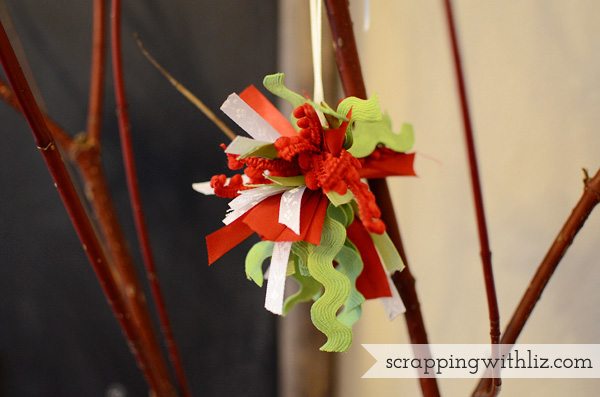 There were plenty of ideas on Pinterest, and we came across these pom pom ornaments, but we made them our own by using different scraps of ribbon I had on hand. I decided the twigs that I found in my back yard (free is awesome) needed some dressing up. We hung them on the twigs instead of the Christmas tree. 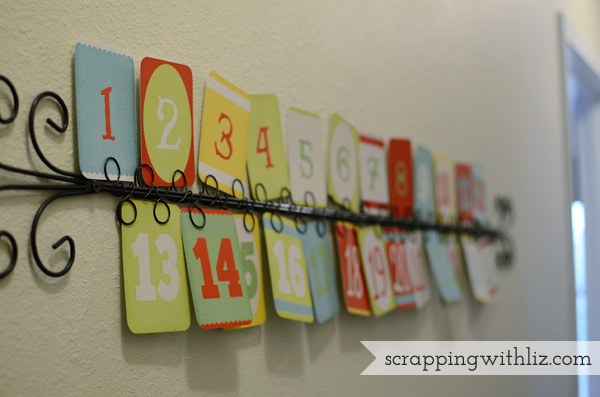 I decided to do an advent countdown with journal cards. I found these cards from Amber Shaw (no longer available), and they were perfect. I used Persnickety Prints to print them...they have a nice journal card printing option with rounded corners! Perfect. Each night, after reading different Christmas themed verses from the Bible and reading a Christmas book, we write down (on the back of the card) our favorite memory from the day. My plan is to keep the journal cards and make a little book out of them. It will be fun to look back on them throughout the years....this is another new tradition I've decided to start this year. I'm hoping all these new traditions stick....we'll see! The above photo holder usually holds Instagram photos. 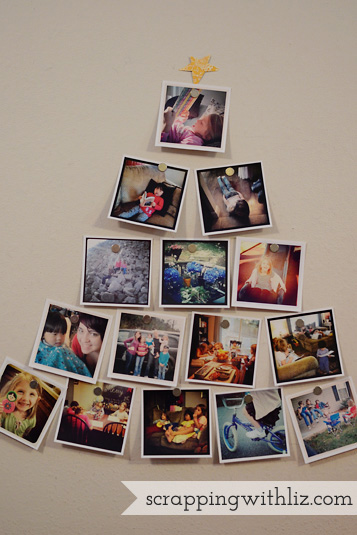 Since I had all those photos hangin' out I decided to make this little Instagram tree. It hangs on our magnet board downstairs...all by its lonesome with no other Christmas decorations. It's kind of cute. My 6 year old made the star for the top. And then there was a baby shower. 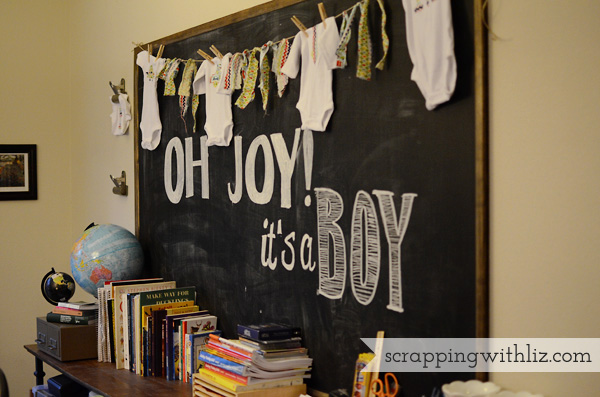 One of my dear friends is welcoming a new little boy into the world any day now. I decided to utilize my chalkboard and use it as some of the shower decor (this was the day before I made the Christmas chalkboard). 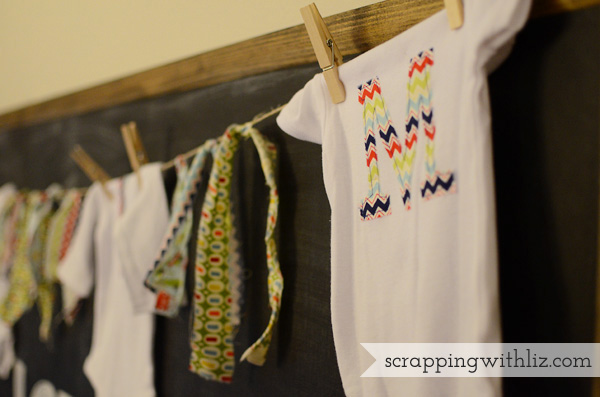 I made little onesies for her then used them, along with the leftover scraps, to make a little banner. Yes, I'm getting into sewing and applique a little bit....like I need another hobby. Actually, my girls are mostly getting into it. I just kind of do it when I need a break from scrapping or working! I love it all!!! My chalkboard has remained blank as i have not taken the time to finish writing on it. Yours is amazing. I also love the instragram photo holder. Going to have to research getting one of those! Merry Christmas. You are doing such a great job with your family raising them in the Lord! LiZ! Your Chalkboard writing is TOP NOTCH!! great job and SUPER cute! Thanks for sharing! Wow! What pretty decoration! Two weeks ago, was my sister’s bridal shower in one of the prettiest venue New York and we had this theme of old 80s and it was a blast, we had a lot of fun. The only thing I probably missed which I really like in this post was a black board.